I'm migrating my site to a new host. On my existing host I updated my site from Vanilla 2.6.3 to 2.6.4 and confirmed that it worked. After that I did a full export from cPanel. After importing the site on the new host, I can get the site to work fine except that my main theme "Bootstrap" doesn't work. It works fine on the old host. The only difference that I'm aware of is that the old host is using MariaDB and the new host is using MySQL DB. As such the other parts of the site seem to be working fine. 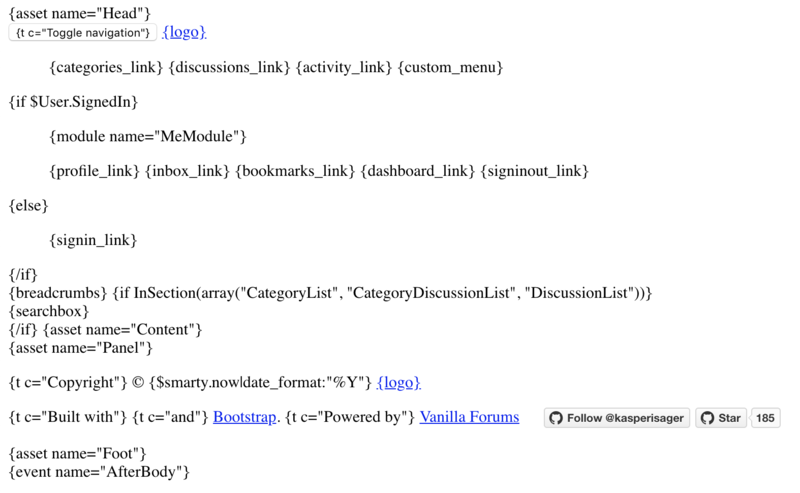 Just that my main theme Bootstrap isn't working. Hope someone can help me resolve this. I really like this theme and it has been working well for me for the past 2 years. UPDATE 1: I have the Bootstrap theme folder with a capital B, as mentioned in other threads. UPDATE 2: When I Preview the Bootstrap theme, it looks perfect, but when I apply it, it is broken as shown in the screenshot above. I have resolved the problem. In the views folder of the theme, I had the main default.master.tpl and its backup default.master.tpl.bak . After removing the bak file, the issue got resolved. Not sure why it didn't like it when the same was working fine on the old host. Only that you were lucky it worked before, tbh. Two copies of the tpl file in the same folder, however you name the second, normally causes issues.